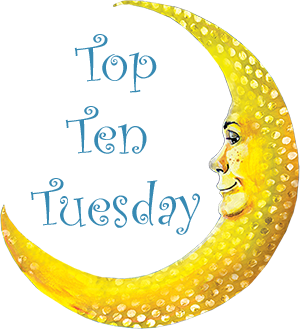 This week's top ten topic is a freebie! I chose the above topic for this week. These are the gals that I think I'd be great friends with. 1. Sookie Stackhouse - (Sookie Stackhouse Series) I've stated it before and I'll state it again. Sookie is a serious bad-a** with an awesome attitude. She's strong, independent, and fun. Even though tanning isn't my thing, I'd slather on five layers of 100 SPF just to lay out in the sun with her and chat about everything. She's also a reader, which is a plus. On top of ALL of that? Body shaming? Please! She embraces and loves her size 10 (and so does pretty much every guy she's ever met... ever). 2. Maleficent- (Maleficent) I'm going off of the recently released book by the same name where the gorgeous and stylish villain from Sleeping Beauty (who has always been my favorite Disney villainess) was just in a really bad place at the time. Now everything's cool and she's back to being her fun-loving faery self and we are TOTALLY BESTIES. I'd love to hang out in her tree and have mudfights with the sprites. Best. 3. Sunday Woodcutter - (Woodcutter Sisters) Sunday is calm, collected, graceful and creative. Even though I can't sew, I can see us sitting for hours and chatting while working on something. Maybe with her positive influence I'll finally be able to crochet a darn scarf. 4. Brenna O'Toole - (The Ghallagers of Admore) Brenna is a spitfire! She's hilarious and hardworking. A mechanic and a fix-anythinger Brenna will be the first top hop under the hood of your car if you're stranded on the side of the road. She speaks her mind and I know I'd never get anything but honesty out of her. She has a gillion sisters already but she'd sure feel like one of mine! 5. Sophie Hatter - (Howl's Moving Castle) Who wouldn't love Sophie? She's a no-nonsense person with a hidden romantic side. Even being turned into an 80 year old woman didn't phase her. She packed up her stuff and off she went to start a new life somewhere else. Get stuck dealing with a messy and tantruming Wizard? No big. She sorts him out and he falls head over heels for her! FIRE DEMON that wants to eat her eyes? Whatever. He's like family now. Sophie goes on so many adventures without even realizing it. That is one cool lady. 6. Luna Lovegood - (Harry Potter) This one is kind of a "Duh". It's always nice having a quirky friend with a different perspective on the world. Intelligent and loyal and just plain interesting. Luna's strangeness is endearing and she's full of light and positivity and she's certainly not afraid to be herself, thank you very much. 9. Abra Walsh - (Whiskey Beach) - I didn't like this book. AT ALL. But weirdly, I liked Abra. She's your Manic Pixie Dream Girl but is actually interested in a relationship. She does pretty much everything. Massage, Yoga, jewelry making, baking. She's your all around hippie/hipster type who has a shady romantic past that she has OVERCOME to be the independent woman she is today. 10. Aurora Teagarden - (Aurora Teagarden Mysteries) This one was iffy. Aurora and I have this love-hate thing going on. Most of the time I think she's annoying as hell, but then she does something that makes me love her again and it's Ok. Overly polite, not entirely authentic, very dry without much color to her personality. She's very grandmotherly even in her 30's but she handles difficult situations with ease and does happen to have a lot of love in her heart. Oh, and she's a librarian who lurves to read. Check. Really, though, I think Aurora and I would be better off as sisters (so we could argue all the time). What was your Top 10 this week? Great list! Luna would make mine too. That is a great list. I loved True Blood, but I have never read the books. This is such a fun topic! And Sookie is a favorite of mine too, I loved those books so much mostly because she's so awesome. Luna is so lovely, I always loved when she showed up in the books, she'd be a great friend to have. I agree that Sophie Hatter is an incredibly cool lady! Maleficent was always my favorite Disney villain too!